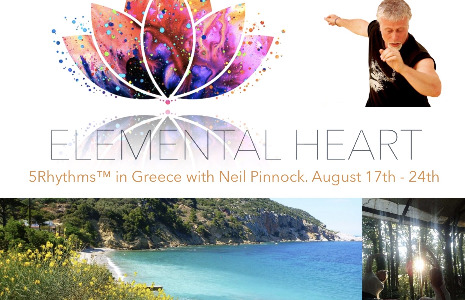 Elemental Heart with Neil Pinnock. A Heartbeat™ and Waves™ workshop. Join us on this workshop in the Greek sunshine. We will celebrate life and explore the territory of body & heart through the 5Rhythms dance & community living. Elemental Heart is a week of dance and exploration; an invitation to discover who we are when we are willing to turn up and participate in life and with each other. Using the maps of the 5Rhythms™ developed by Gabrielle Roth, we will give attention to our bodies and honour our emotions through movement, breath, dance and community. Each day we will dance, share, eat together, go to the beach and participate in some of the activities that sustain our community. This will be a nurturing and transformative week, supported by the dance and the community. More than just a workshop, more than just a holiday. Based in the wild woods of Anilio, at the well-established community setting of Kalikalos Holistic Network, we are close to beautiful beaches on the Greek Pelion peninsular. There are a range of options for accommodation including shared rooms and camping within the community facilities. Workshop time is around 3 hrs a day mainly in the mornings. We will dance together for 6 days, a mixture of Waves and Heartbeat material, totaling around the equivalent hours of 2 days Waves, 1 day Heartbeat.